Brian Iddon discovered a passion for chemistry as an eleven-year-old schoolboy. He went on to study it at university, obtaining a BSc, PhD and DSc, and taught and researched his subject at the highest level before making his name in the wider world by presenting a demonstration lecture called ‘The Magic of Chemistry’ to audiences across Britain and Europe. Brian’s second career was in politics. Elected to Bolton Metropolitan Borough Council in 1977, he fulfilled a wide range of public roles over the next 20 years. In 1997 he was elected to Parliament by the safe Labour seat of Bolton South East, retiring in 2010 after a career in which he wrestled with a range of hot topics from drugs to euthanasia and from health food to peace in the Middle East. He helped to steer through three Acts of Parliament and was a member of the Science and Technology Select Committee. 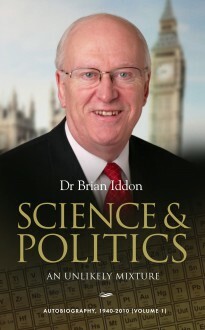 In retirement, in addition to voluntary work, Dr Iddon has finally found time to write his memoirs – this is Volume 1.